Daily Mirror - Dissolve Parliament- MR tells govt. Dissolve Parliament- MR tells govt. Former President Mahinda Rajapaksa today called on the government to dissolve Parliament immediately and hold a General Election to end the current political instability in the county. He expressed these views in a special news conference which is being held at the Sri Lanka Podujana Peramuna (SLPP) headquarters at Nelum Mawatha, Battaramulla. Hope the present government will shut up its mouth. Hope the present government will shut up HIS mouth. Most people who voted for Maithree didn't even bother to vote this time because the govt is dragging its feet with regard to punishing the mega thieves of last regime.Give them the due punishment they wll be more than happy to support the present govt in the general elections. This was not a general election. These results are very close to the LG results 3 years ago, so nothing has changed. Govt has 2 more years to go. He is still in his dreams. See how arrogant this moron is. ee he piecemealed elections when he was in power. At the last Parliamentary elections held in 2015 people gave a mandate for a new government to rule until 2020. This was not Parliamentary elections. So why should government resign? On January 8, 2015 people only voted for a new President. Then why did MS give the PMship to a party with ONLY 46 seats ? Congratulations! to you sir. Whatever said and done,still people have immense confidence in you. Hope you will cautiously clean your party and march forward for the benefit of the people and the country. Good Luck. Dissolve the parliament or face consequences. Who MR? Of course he will. So while you point your fingers, someone else is judging you. ITs Election mania fever now and there is no cure. Why not a presidential election ? Presidency now older than parliament. He wont want that because he cant contest! Why didn't all the protest voters vote for JVP. Why did the protest overs choose MR????? Of course, so that you can stop the investigations lock stock and barrel on all what you did in the past. MR who you are give orders to dissolve parliament ? We all knows you are in power greedy. All these comments and likes say following01. Daily mirror posts only the comments favoring UNP. 02. An organized "Sirikotha" team is working to react the all political news. Mr. President, you have to take the appropriate decision nowyou have got very less time.I hope you will understand what i meant. please give the correct punishment to the wrong doers. Still you cant understand what kind of a person need to president in our country. Since Jan. 8th, his % of votes have got reduced. Well below, 50%. Therefore, he doesn't have a right to demand with a 44% of votes. MR You are a good preacher. When you all are in power you look for short cuts to extend your time. This elction is only eye opener and they have another two years to deliver the goods. There is nothing wrong with the government you jackass. Let the UNP run it in total for its full term. Next election campaign slogans for you of course in Sinhala Language. Make Sri Lanka Great Again (was it ever?)! A beautiful Thing! Fake News Media! We are Winning! Opposition Losers! Winning Like Never Before! These worked in a powerful country for a Powerful man! The results show the winning Pohutowa only gained 45% of the total votes balance the other parties 65% polled.No doubt Pohutowa will loose in the election in the general election. Well, sometimes calculators show error message! It is 55% not 65%! 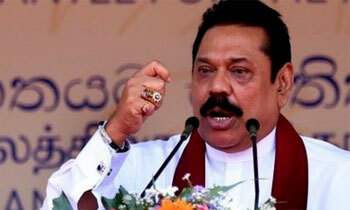 The people may be looking for a change, but not the Rajapaksa's ever again. Who's money will be spent on the election? Do you think that present administration will ask problems like you? You had prsidential election 1 1/2 years earlier and went home earlier due to you are heavily greedy . Its amazing how people keep repeating "Hora" "Hora" to those in the previous regime when even after 3 years in power this Govt has not been able to bring any charge of consequence against anybody.! It appears most of us are fools that just thrive on innuendos without proof?? - Good for Rajitha!! Yes, he wants Namal to be the President. Will bring back Nishantha to run UL, Cabraal - CB, Weerawansa likely foreign minister, Udayanga , HC to UK. Forgot, Basil will restart at 20 per cent. Does he think that he is the owner of this country ? I do not see any major issues with the present Government. Everybody should admit that they have done certain changes to the existing administration. Establishing Police Commission, Election Commission, Right to Information. This is the first time we witnessed that this election was free and fair and no posters and banners like past. They have another two years left and wait and see what they going to do. I think their is no need of change right now. This is a wake up call for the current government. Now all 3 might been realized the people are not fool. Stop interfering on other parties. We people voted and chose you to do good for us. If you neglect you'll be kicked off. No need to change the governance. Let the governance make themself pure. Yes, look at WW - how happy he looks dreaming that he can go free and keep all that stolen stuff! Still 2 years to go and time to catch up on things that should have been done in the first year. SOMEONE SHOULD REMAIN HIM THAT IT IS THE LOCAL GOVERNMENT ELECTION, NOT A PARLIAMENT ELECTION.